Adobe bricks are the foundation of an ADOT project designed to increase pedestrian safety on State Route 80, while improving the appearance of the highway through the heart of the popular tourist town of Tombstone. Brian Tellez took a brief walk around a stark landscape surrounded by tall mounds of dirt and rock at the Tombstone Silver and Gold Mine in Cochise County, deciding it was the perfect place to start replicating 19th-century adobe bricks. Confident that the proper materials were available, Tellez and his three-man crew got busy beneath the high-desert sun on a hot August afternoon. They set wooden forms, mixed sand, silt, clay and grass, and made adobe bricks in the same way as the prospectors who found riches or ruin in the southeastern hills of the Arizona Territory in the late 1870s. These adobe bricks are the foundation of an Arizona Department of Transportation project designed to increase pedestrian safety on State Route 80, while improving the appearance of the highway through the heart of the popular tourist town of Tombstone. 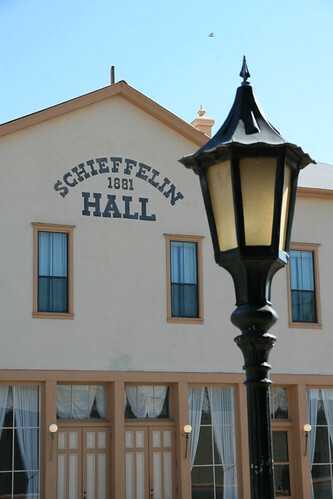 As part of the $1 million improvement project, ADOT crews will replace sidewalk in a three-block area in front of the historic Schieffelin Hall, the former theater and ballroom built in 1881, and along both sides of Fremont Street, which is the local name of SR 80 where it passes through Tombstone. To make the street more pedestrian-friendly, ADOT will narrow the width of the street and add lighting within the project area. Schieffelin Hall, located on SR 80 where the highway cuts through Tombstone with the local name of Fremont Street, is among the largest standing Anglo-American-built adobe structures in the Southwest. It is named for prospector Ed Schieffelin, whose quest for silver from the local landscape gave birth to the Old West town’s fabled name. But silver won’t be one of the materials used to fortify the two-story structure for future generations. Due to the frontier significance of Schieffelin Hall, strict guidelines for historic preservation dictate the manner in which the 134-year-old building will be repaired. At the core of those guidelines is the need to replicate the materials and process that were used to create the original adobe bricks. If the new bricks don’t match the old, they won’t properly meld together to create the solid adobe wall that gives the structure stability. The process complies with guidelines from “The Secretary of the Interior’s Standards for Rehabilitation,” a technique required by the National Historic Preservation Act because Schieffelin Hall is a contributing property of the Tombstone National Historic Landmark. Tellez and his team manufactured 300 bricks, each 16 inches long, eight inches wide and four inches deep. With the aid of the desert summer sun, they cure in about two weeks. The water damage to the adobe at the base of Schieffelin Hall’s walls facing Fremont and Third streets – across SR 80 from the infamous O.K. Corral – was caused in part by the absence of the front porch that adorned the building from 1881 until 1909. For more than a century since the porch came down, water has drained from the roof through downspouts that empty at the base of the building, where it pools at the foundation and seeps into wall joints. A new porch that will be constructed on the front of the glass storefront as part of ADOT’s project will channel rainwater away from the base of the building, preventing future deterioration of the adobe walls. Shoring up a historic building is unique work for a state transportation agency. “Highway projects seldom include architectural work of this type, but it was absolutely appropriate for this location,” said ADOT Safford District Engineer Bill Harmon. “Tombstone is a national treasure and authentic features like Schieffelin Hall are becoming extremely rare. Tombstone is much more than a premise for ‘Old West’ movies. It behooves us to preserve and safeguard Schieffelin Hall for future generations,” said Harmon. The restoration work is funded through a special federal Transportation Enhancement Grant awarded to the city of Tombstone. The preservation work was combined with a highway safety project and both are being administered by ADOT. Having fallen into disrepair in the 1960s, the hall was purchased by O.K. Corral owner Harold Love, refurbished and returned to city ownership. Efforts to improve Fremont Street and Schieffelin Hall have been in the works for years and are expected to be completed in mid-2016.